A woman has had 27 contact lenses removed from one eye after going to Solihull Hospital for routine cataract surgery. In a report published in the BMJ, the authors said the 17 lenses had created a “bluish…hard mass” that was “bound together by mucus”. After discovering the foreign body, surgeons went on to discover 10 further contact lenses using a microscope. The patient was 67 years old and had worn disposable lenses for 35 years. She had not complained of any irritation. Rupal Morjaria, a specialist trainee in ophthalmology and one of the report’s authors, told Optometry Today: "None of us have ever seen this before. "We were really surprised that the patient didn't notice it because it would cause quite a lot of irritation while it was sitting there. The report says the patient had "deep set eyes" which might explain how the "unusually large" number of contacts could have been stuck. Can you sleep in contact lenses or use saliva to keep them clean? Take RNIB's eye health quiz to brush up on your knowledge. 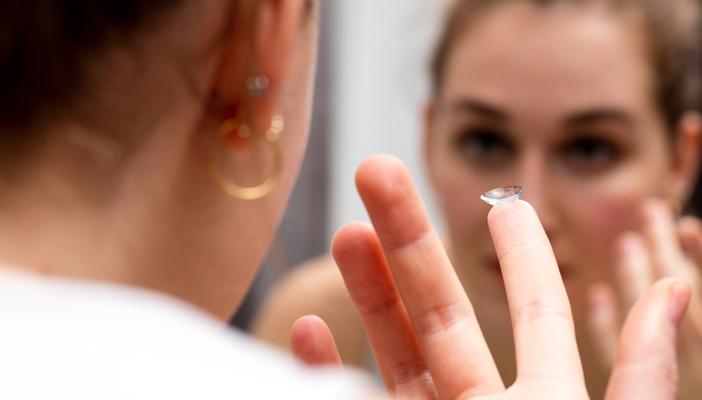 Acanthamoeba keratitis is a rare disease that can affect people who wear contact lenses. Find out how one campaigner is helping to raise awareness for the condition.